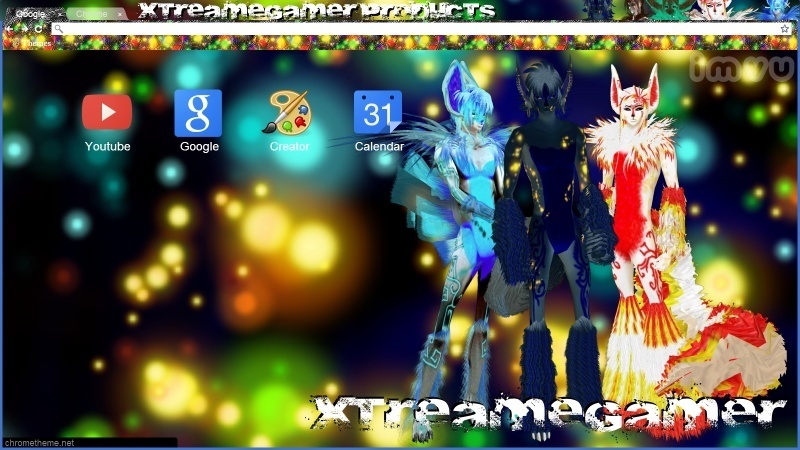 Download the official XtreameGamer Google Chrome themes. Want me to make you a customized theme? No problem! To get me to make your theme is to describe what you want everything to look like down to the detail, or draw out an idea. After you have everything you want PM me the step by step instructions or drawing with a title "Google Chrome Themes" and in the text box add your IMVU username. I will then work on your theme then send you a screen shot of it so you can see what it looks like before you send me any credits! I couldn't have made it more simple. The cost is 1,000 credits a customized theme. I will have put your username on the theme so everyone will know of your theme just tell me where to put it. Once you like the theme and wish to install/download it then send me another PM that you want it and I will give you the details. If you want the theme to have specific images with your avatar like mine as well then upload the pictures to Tiny Pic or link me to the pics in your gallery like this: http://userimages-akm.imvu.com/userdata/56/14/77/91/userpics/Snap_5243124154f46ee14c9c95.png by going to your IMVU gallery in your browser clicking an album (Published for everyone to see) and click on a pic then click on it again and you'll have the link I posted you, and make sure to include them in your PM message box. Note: Please make sure your images have clear backgrounds. I mean invisible backgrounds when you take the pic click the chair Icon and it should cut out everything in the background. Do NOT send me credits unless I KNOW it's from you. As I said before if you like the theme PM me and I will work out the details with you regarding on buying your customized theme. Please make sure your themes abide both my forum and IMVU rules. It cannot have ANY UFI content involved or copyright infringement. If you make your own theme I would suggest not putting any UFI content into the theme if you do make sure your screen shots you share with people do not have any AP content in it or your IMVU account maybe suspended until further notice. I will not be responsible for your IMVU account or themes if you make them and I will NOT make any themes with any UFI content in it. If you wish to share snapshots of your theme on this forum make sure it abides to all forum rules.